Our politicians – who in Britain are now carrying out a wholesale transformation of society without a democratic mandate – have ever-decreasing legitimacy. Our financiers – their huge corporate risks underwritten by the taxpayer – are literally and morally bankrupt. All this is done in our name, the public, yet we seem to have no genuine say in decision-making and no power to effect change. 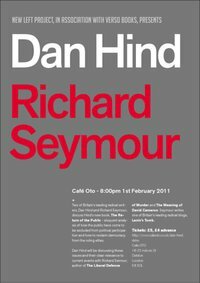 In The Return of the Public, Hind examines the mechanisms through which this has occurred and proposes a way forward for a new participatory politics, one based on a wholesale reform of the media. After the failure of the private, now is the time for the return of the public. Do come along. RSVP here.